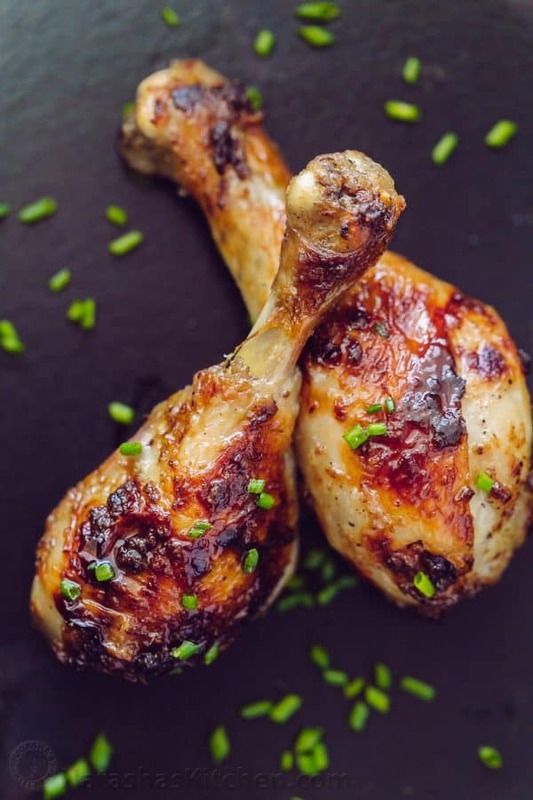 These baked chicken drumsticks are finger-lickin’ good! They are tender and flavorful with a crisp salty skin. My Mom makes these all the time and uses the same recipe for bone-in chicken thighs. 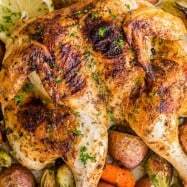 The marinade only needs 4 simple ingredients that everyone has in their pantry, but my Mom’s brilliant method will become your secret weapon for marinating all kinds of bone-in-chicken. 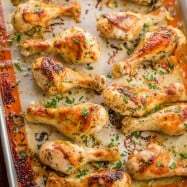 Baked chicken drumsticks are perfect for parties because they are inexpensive, easy to prepare, and satisfy a crowd. 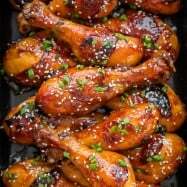 Marinating overnight produces supremely tender and flavorful chicken drumsticks. The seasoning penetrates the meat resulting in perfectly seasoned chicken from the crispy skin to the tender center. 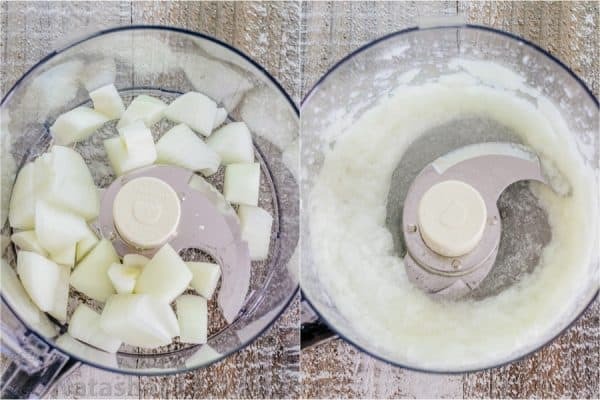 *You can either puree onion using the star side on a box grater or chop into pieces and puree in a food processor or blender. Onion should be consistency of applesauce. 1. 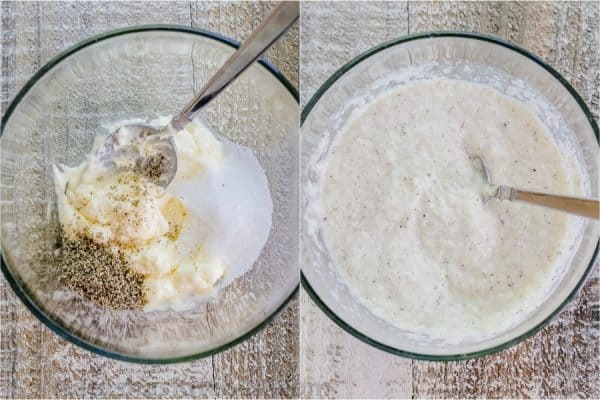 In a small bowl, stir together: onion puree, 2 Tbsp mayo, 1 tsp black pepper, 1 Tbsp salt and hot sauce if using. 2. 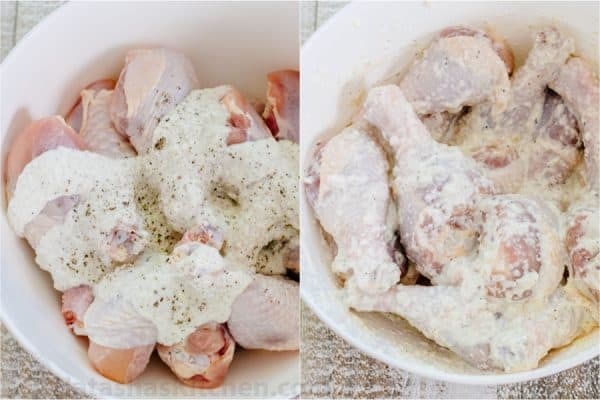 Place chicken drumsticks into a large mixing bowl or soup pot then pour on the marinade and toss to coat. Cover with lid or plastic wrap and refrigerate at least 6 to 8 hours or (preferably) overnight. 3. Line a rimmed baking sheet with parchment paper or foil and bake skin-side-up at 400˚F for 45 minutes then turn drumsticks over (skin-side-down) and bake another 15 minutes. 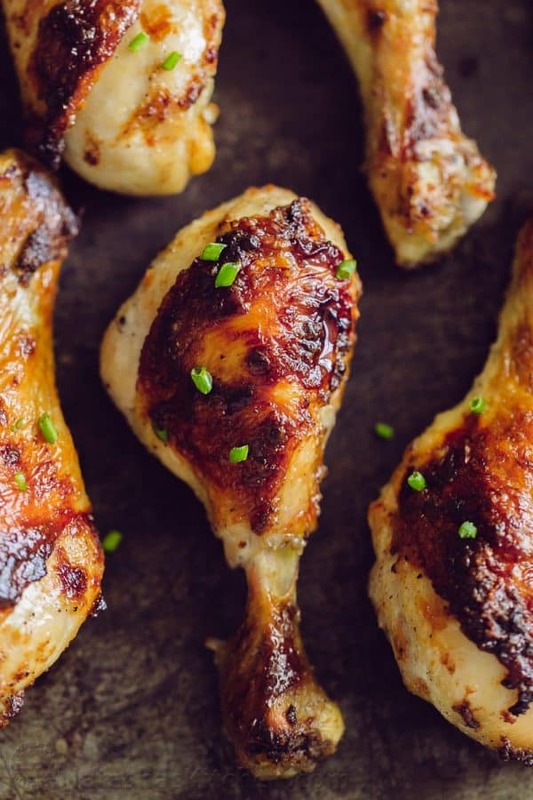 For extra crispy skin, turn drumsticks again and broil 3 minutes or until skin is browned and crisp. Tips for Speed Marinating: We’ve tested marinating 4 hours and the meat wasn’t as tender and tasty as overnight marinating. However, if you have a foodsaver, you can marinate in an airtight bag and have it done in 2 to 4 hours. Did you know that a foodsaver can marinate foods faster? Removing the excess air forces the marinade into the meat. We’re absolutely in love with our foodsaver. These chicken drumsticks are finger-lickin' good! They are tender and flavorful with a crisp salty skin on the outside. In a small bowl, stir together onion puree, 2 Tbsp mayo, 1 tsp black pepper, 1 Tbsp salt and hot sauce if using. 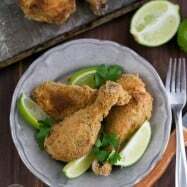 Place chicken drumsticks into a large mixing bowl or soup pot then pour on the marinade and toss to coat the drumsticks. Cover with lid or plastic wrap and refrigerate at least 6 to 8 hours or (preferably) overnight. 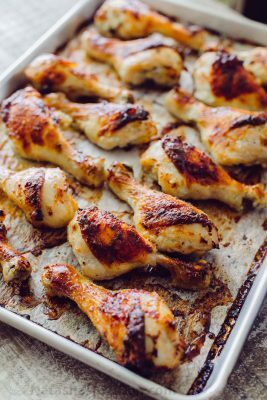 Line a rimmed baking sheet with parchment paper or foil and bake skin-side-up at 400˚F for 45 minutes in the oven then turn drumsticks over (skin-side-down) and bake another 15 minutes. 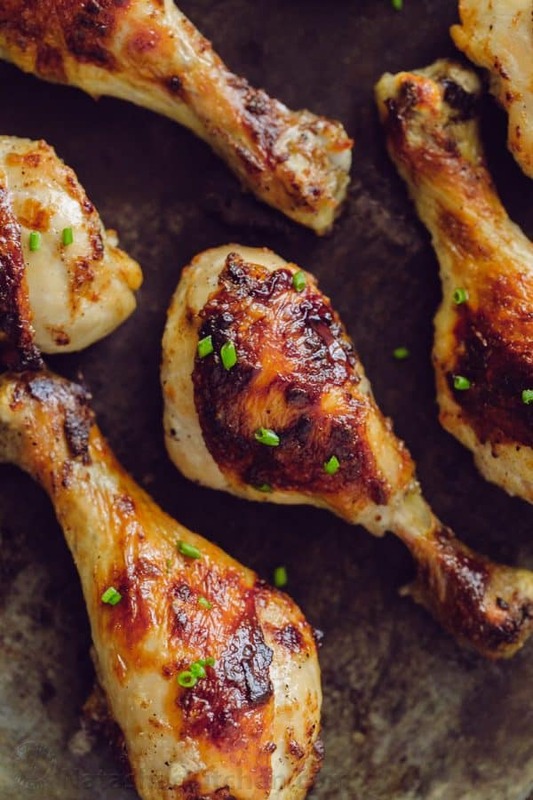 For extra crispy skin, turn drumsticks again and broil 3 minutes or until skin is browned and crisp. *You can either puree an onion using the star side on a box grater or chop onion into chunks and puree in a food processor or blender. Onion should be consistency of applesauce. I will try it today 🙂 Can you freeze some of them? If yes, which stage? This looks great and I can’t wait to try this next week! Would I be able to use light mayo instead of regular mayo? Natasha, this recipe looks amazing. I was wondering if it would do well in an air fryer? 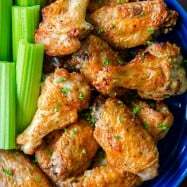 If so, any suggestions for air fryer use with this recipe? Hi Olivia, I honestly don’t have any experience in an air fryer so I’m not sure. Do you love your air fryer and what brand do you have? Delicious, I was somewhat skeptical given the simple ingredients but tried it out due to the fantastic comments. Such a yummy recipe! Added some garlic powder, turned out perfect! Hi Natasha, this was the first time I was cooking drumsticks; and they turned out amazing. Such a simple recipe and the results are finger licking. I didn’t have the hot sauce, so I added cumin powder, cayenne pepper, garlic and black pepper. My grocery had “50% off all cut and whole chicken” and I got 3 ‘family sized trays’ of drumsticks and did your “mom’s recipe” on them. Will these turn out if I don’t marinate them and cook them right away? I have these marinating in the fridge right now – I ended up adding some harrissa as that’s just what I happened to have (other than sriracha) and I also added in some garlic and olive oil as per some of the other comments I read. I did eyeball it, so not sure if I added in the right amount of salt. However it smelled amazing and I had to have the hubby take the kitties into the other room, as they go nuts when they smell chicken. They were great! Super moist and tender. When I do this next, I’ll definitely add more salt and more harrissa. My husband and I ate these with a side of salad (quickly did up a spinach salad with apple, cucumber and red onions with a frankenstein-d vinaigrette which was a mixture of a multitude of things), so super tasty and healthy. We also tried it with bbq sauce and sriracha sauce which was delicious too. Wow, all my years of scratch cooking and it never occurred to me to use as base–let alone marinade base–pureed onion. That is brilliant, Miss Natasha. I enjoyed the heck out of the drumsticks. I did it your way except: added one garlic clove to puree. Didn’t think the mayo alone would be enough of a binder, so added 1 TB of oil to the puree. I stirred into the marinade leftover salsa and some homemade chili powder. The salt and pepper alone were not doing it for me. The beauty of your recipe is it’s easy to do it “my way”. At the end of the day, the onion flavor is the star regardless. If I’m using chicken thighs, do I need to turn them over also after 45 min? so i used foil to line the baking sheet. followed the instructions and they sticked a bit. but it my fault. i should have sprayed it. otherwise they were quick and delish! Would this work just as well on skinless meat? That’s what I have right now? If the recipe would need to be adapted, how should I go about doing that? 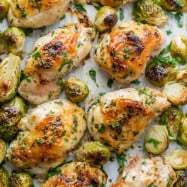 I am making these tonight, do you take the marinade off when putting in the oven or keep it on? I’ve made these things four times in six weeks now; once I made a double batch for a party, and everybody really liked them. Thanks to your mom for coming up with this recipe, and thank you for sharing it! Man, I love these chicken legs!! Marinated overnight and baked them yesterday. The best drumsticks ever! Natasha, thank you for this great recipe!